With this wonderful cool weather arriving this recipe is a perfect hearty Irish comfort food. After cooking and enjoying the great flavors, it reminded me and brought back warm thoughts of the mutton stew I had in Dublin, Ireland last year! Irish stew, is traditionally made of lamb or mutton, potatoes, onions, and parsley. But I am using beef. Original Irish stew was a thick and hearty meal, meant to keep a body warm and on your feet for many hours of hard work. Toss beef cubes with 2 tablespoons vegetable oil in a bowl. Whisk flour, salt, black pepper, and cayenne pepper in a separate bowl. Dredge beef cubes through flour mixture until evenly coated. Heat 1/4 cup vegetable oil in a large skillet over medium-high heat; cook and stir coated beef cubes, working in batches, until beef is browned on all sides, 5 to 10 minutes. 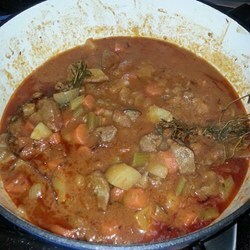 Transfer browned beef to a Dutch oven or heavy-bottomed pot. Cook and stir onions and garlic in the same skillet used for browning beef until lightly browned, 5 to 10 minutes. Stir tomato paste with enough water to partially dilute; pour into onion mixture. Stir to blend. Reduce heat to medium, cover Dutch oven, and simmer for 5 minutes. Pour half the Irish stout into the onion mixture, and bring to a boil while scraping the browned bits of food off of the bottom of the pan with a wooden spoon. Transfer entire mixture to the browned beef. Pour remaining half of Irish stout into beef mixture; add thyme. Cover Dutch oven, reduce heat to low, and simmer for 2 hours. Add potatoes and carrots and simmer, stirring every 20 minutes, until potatoes are soft, about 1 hour. Adjust salt as needed; garnish with parsley.